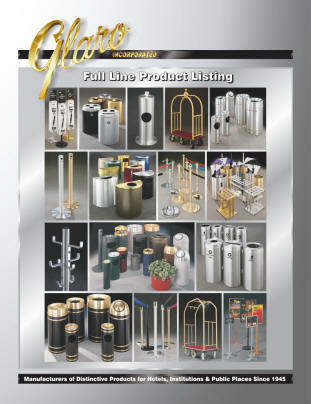 Product Literature - Glaro Inc.
A two sided, full color, printable, PDF sheet (8.5” x 11”) with a photo collage of major product lines and a detailed break-down of each. An excellent resource to help select products for every area of a facility. Also excellent for training staff, e-mail campaigns, direct mailings, sales presentations, and for adding to your website. Click here to order FREE printed literature. List prices effective January 1, 2018 - 40 full color pages with list prices, product photos, complete specifications, finish chart, and “How to Order” instructions for each product. For Download Only. Glaro's Return and Restocking Policy for 2018. Not all products and not all finishes are returnable. Credit will not be issued unless returns are in compliance with the terms of this policy. A full color 4 page brochure representing single pupose Recycling Receptacles. A full color 1 sided sheet showing 27 powder coated textured and non textured finishes. For actual samples please inquire. A full color 2 sided product sheet representing Glaro’s premium 6 wheel Bellman Carts for hotel, condominium, and residential properties. A full color 1 sided product sheet offering economical Value and Utility Carts. A full color 2 sided product sheet representing Glaro’s New Deluxe Line of Bellman Carts for hotel, condominium, and residential properties. A full color 4 page booklet featuring the new Glaro single & double rail portable Pedestrian and Crowd Control Barrier System. A full color 1 sided product sheet for Glaro's Insta-Change Sign Displays. A full color 2 sided product sheet featuring Safety and Security Retractable Strap and Rope Barriers, Sign Holders, & Signage. A full color 2 sided product sheet featuring deluxe floor, wall, and counter top models. A full color 2 sided product sheet presenting 20 different safety yellow silk screened Sign Panels.